As the Seattle Seahawks finish the first quarter of the season, their offensive line is still a major work in progress. But that should come as no surprise. 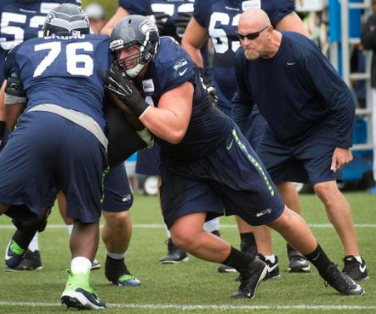 Coach Pete Carroll and offensive line coach Tom Cable are satisfied with the steps the unheralded unit has taken, knowing it was always going to take half the season for Russell Okung, Justin Britt, Drew Nowak, J.R. Sweezy and Garry Gilliam to jell. Cable has said several times that this is the most talented group of linemen he has coached. Since an expectedly horrendous game in St. Louis, the unit has played better the past two weeks. They were especially good running the ball in the second half of the 26-0 win over the Chicago Bears last week, with Thomas Rawls gaining 98 of his 104 yards. Ahead of the Detroit game, the Seahawks ranked fifth in the league at 134 yards per game and tied for third at 4.7 yards per carry. The sacks have not all been on the offensive line. Quarterback Russell Wilson has sometimes not gotten rid of the ball quickly enough — or has been caught short of the line of scrimmage while scrambling. The receivers have not gotten open enough, tight end Jimmy Graham has let some guys get past, and offensive coordinator Darrell Bevell has chosen to use three receivers more often than two tight ends or two running backs. Cable said the offense is “getting closer” to fixing the pass protection problems. As for the development of the front five, Cable said it requires patience. He said this quintet is farther ahead of recent squads and should look pretty good if it stays healthy and playing together. “If we get there in a month, six weeks, two months, whatever it takes,” Cable said, “and by the end we’re one of the best teams, that’s all that really matters. For previous status reports on the offensive line, check out the new offensive line page.